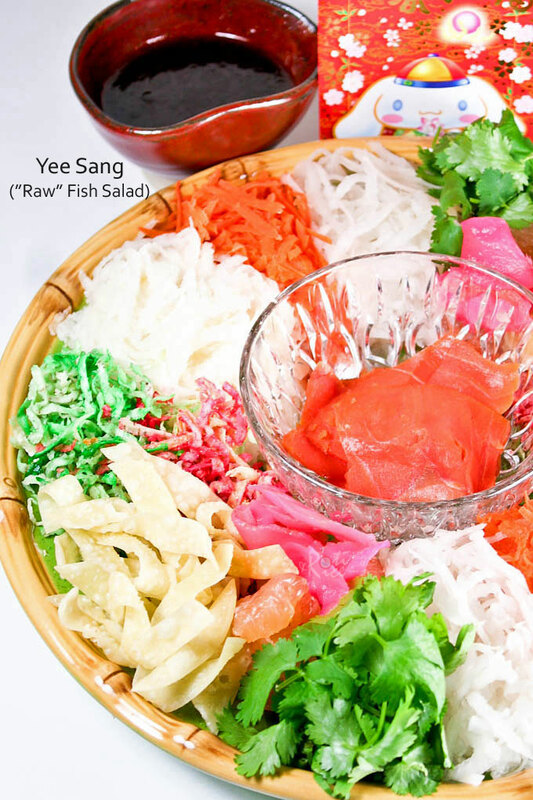 Yee Sang is a raw fish salad and a must-have for the Chinese New Year Feast. Make it at home using lox and a variety of crunchies and vegetables. This year, we combined the Reunion or New Year’s Eve dinner and New Year’s Day vegetarian breakfast into a big feast on Saturday, the third day of the Chinese New Year. The first day which fell on a Thursday was like any other day. It made more sense to celebrate during the weekend when we did not have to rush around for work and school. I immediately set to work after brunch on Saturday morning to prepare the seven dishes I had planned to cook. I did however, shred all the vegetables and fried all the crunchies for the Yee Sang on Friday morning. Also, the pork for Roast Pork Belly (Siew Yoke) was left marinating overnight in the refrigerator. This is my second year preparing Yee Sang here in the US. While I did a post on it last year, I did not provide the recipe. It turned out really well and Ro-Ri San specifically requested that I make the salad again this year. I was more than happy to oblige as I wanted to eat it too. I remember as a child that I enjoyed the “lo sang” or tossing part but was not that enamored with the taste of the raw fish and vegetables. Perhaps this is a more adult kind of dish but being away from Malaysia, I have not had a chance to enjoy it for many years. Absence has certainly made my heart grow fonder for it and last year I decided to prepare it myself. We had two gatherings and I made this salad for the New Year Eve dinner as well as Chap Goh Mei (15th day of the New Year). It was a big hit and everybody loved it! 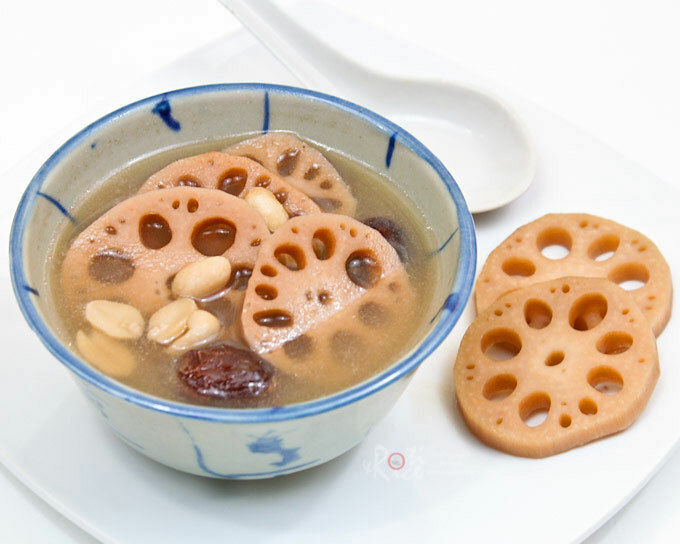 There is still time to prepare this dish as it is served throughout the fifteen days of the Chinese New Year. I have improved on the dressing and really like this version. I used smoked salmon (lox) instead of raw fish for safety reasons. Using a grater, shred taro, jicama, daikon, and carrot into long strips. Keep shredded vegetables separate. Do not mix. Divide shredded taro into two. Color one portion with two to three drops red food coloring and the other with green food coloring. Deep fry shredded and colored taro until crispy, about 5 to 6 minutes. Remove and drain on paper towels. Keep the two colors separate. Cut wonton wrappers into strips. Deep fry until golden brown. Remove and drain on paper towels. Place smoked salmon a small bowl. Mix in lime juice. Arrange all shredded vegetables, pomelo, pickled ginger, crispy taro, crispy wonton strips, and cilantro into individual sections on a large platter. Place bowl of smoked salmon in the center. When everyone is gathered round, pour smoked salmon onto vegetables. Sprinkle five spice powder and toasted sesame and drizzle dressing over vegetables. Get everyone to toss the salad using chopsticks. These are the other auspicious sounding dishes I made for the feast. 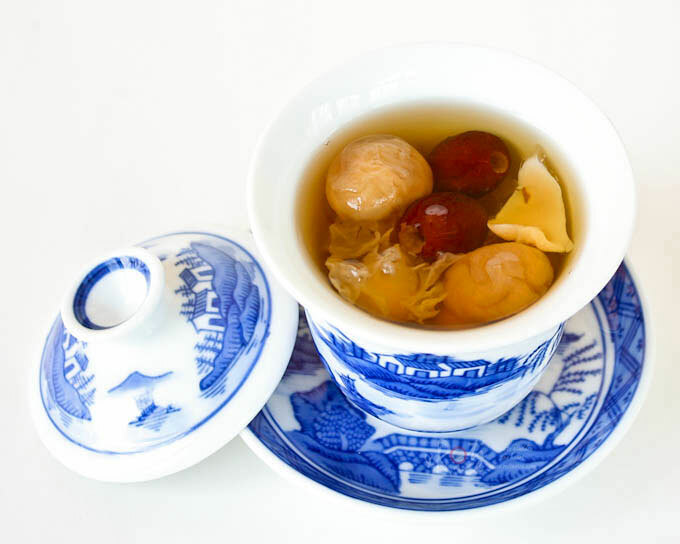 I also made this sweet longan soup for dessert. It rounded off the meal very nicely. that is fantastic! you made your own… Big thumbs up to you. wow I want to taste some now! Sometimes I thought you were a Japanese, sometimes a Malaysian, but now I think you are a Chinese as everything here in this post are so traditional Chinese! This recipe are great. very traditional Chinese food! That is a gorgeous and very colorful dish, Biren. I never would’ve guessed that the green and red stuff were taro. I love your presentation of this dish. So colorful and welcoming, beautifully presented. Your other dishes look delicious as well. Ho see fatt choy is another favorite of mine. When I was a kid, I used to think the fatt choy was hair. Haha. Thanks for sharing, Biren. Looks like you guys had a good feast. Wow Biren, you certainly know how to keep the tradition way of living. I really wanted to make my own yee sang next year. My in-laws’ place had never celebrate the new year with yee sang so far. Probably a surprise for them! Hope you’re enjoying your time and have lots of fun. Thanks Kristy! Wishing you health and happiness as well. 🙂 Yes, it would be a lovely surprise for your in-laws. Homemade yee sang is very fresh and tasty. There are many variations and you can add chopped peanuts, jellyfish, and others if you prefer. Alamak! That is really a labour of love!! Everything home made! Your family must love you very much! It’s beautiful. 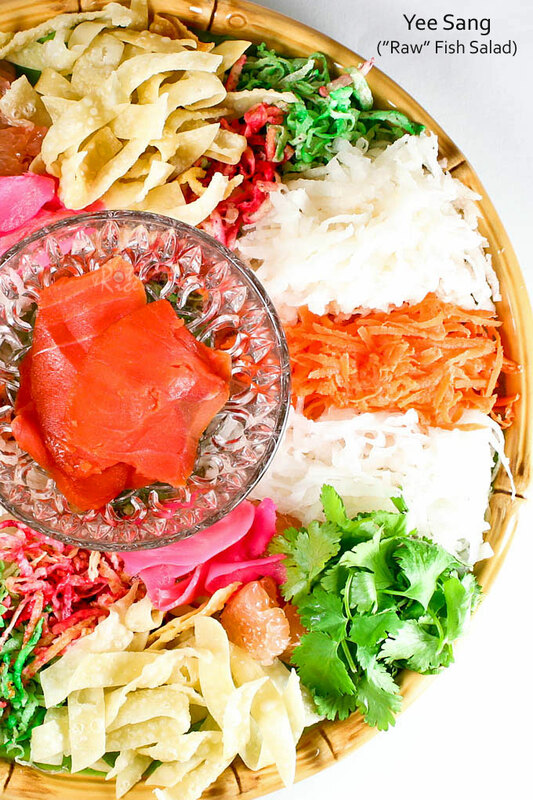 Funny thing is that I love sashimi but never could enjoy yee sang – it always smelt and tasted fishy to me, unlike sashimi. But I think I will surely enjoy yours!! It is a lot of work especially the crunchies but totally worth it. I have made enough for another session on Chap Goh Mei. You may enjoy this version better with the smoked salmon. The raw fish was probably not as fresh as it should be. Happy CNY to u, Biren! Wow, what a loh heh! I didn’t have any of that this year but I’ve created something special. Hey! What happened to my comment?? What a fantastic feast! Thanks for sharing your yee sang recipe. I absolutely adore and miss eating it. It looks so good and am sure it is. Happy new year! I love yee sang! It’s so much fun tossing the salad, even if you create a huge mess to clean up afterwards lol. Tastes really good too! You made loads of amazing food for CNY! I love the gai lan and roast pork. Delicious! Love the lovely colours of the salad. That’s a beautiful dish – all that work you put in is incredible. Happy new year! 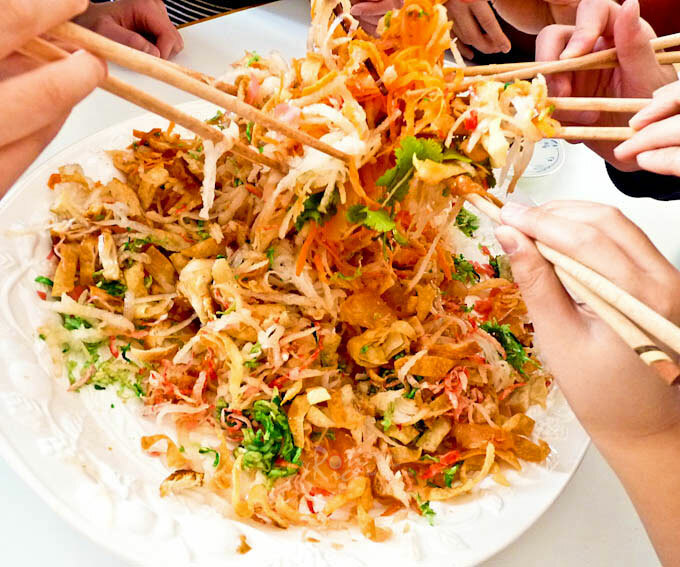 What a terrific feast and yee sang looks gorgeous, I would love to try this! Wow, Biren, what a beautiful and colorful dish! It looks amazing, and like a lot of hard work. You did an amazing job with that spread… Did you live somewhere before you lived in the US? Random question, I know, but you mentioned that this is only your second time making it here in the states. Oh I so want to come over and celebrate with you. I’d love to stand in your kitchen for a week and watch you cook. That would be my perfect vacation! Gosh, that’s lot of goodies and all done by you single handedly! Your home made yee sang looks so fresh and yummy. I’ll never attempt to make it as it entails too much work. You’re great, Biren! Thanks Cheah! It was a lot of work but totally worth it when I see the family enjoying the food. 🙂 We can’t get yee sang at the restaurants over here and so the only way to eat this special dish is to make it at home. That salad looks like so much fun!! It’s presented so beautifully and I love how everyone comes together to toss it together!! The other dishes you made look good too, though they are not ones I’m familiar with 🙂 Happy Chinese New Year and I’m glad you enjoyed your celebration this weekend! I was wondering what the green and red were so I’m glad you explained. I’ve never seen taro like that. What a gorgeous wonderful presentation for that salad. Now that is a beautiful platter of food! Thanks for explaining what everything is…I would love to make my own, maybe next year. 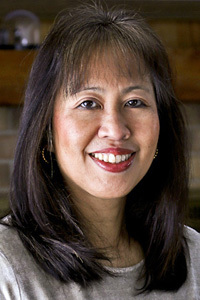 Wishing you and yours a very happy Chinese New Year, Biren! What incredible celebratory food. Did you make everything on your own? DOes that mean others help in another way? What is the significance of the red and green taro? Such a gorgeous salad and I really appreciate the tradition of everyone tossing the salad in unison. A beautiful holiday tradition that would not be the same without it. Clearly! I cannot imagine the taste, but it looks and sounds very tasty and with a great variety of textures. Yes, I prepared all the dishes on my own. The guys helped to eat. 🙂 The red and green taro are for aesthetics. Red is an auspicious color which symbolizes joy and good fortune while green is associated with health and harmony. Yee Sang? I never had this dish…and sure it sounds a lot of fun and so tasty with all the yummie stuff in it 🙂 Happy New Year Biren! Wow, Biren – what a celebration and labor of love! 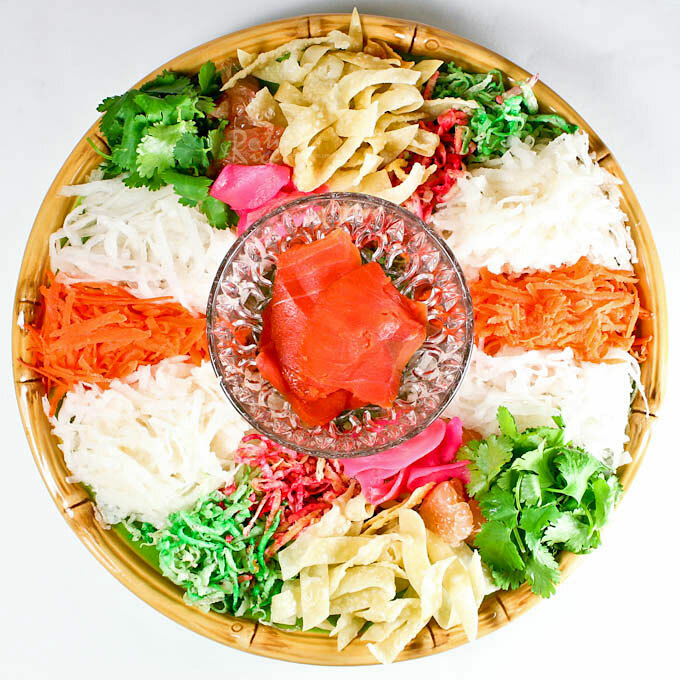 Your Yee Sang is full of color and fresh flavors and the tossing of the salad once everyone is assembled sounds so fun. Happy New Year to you and your family! 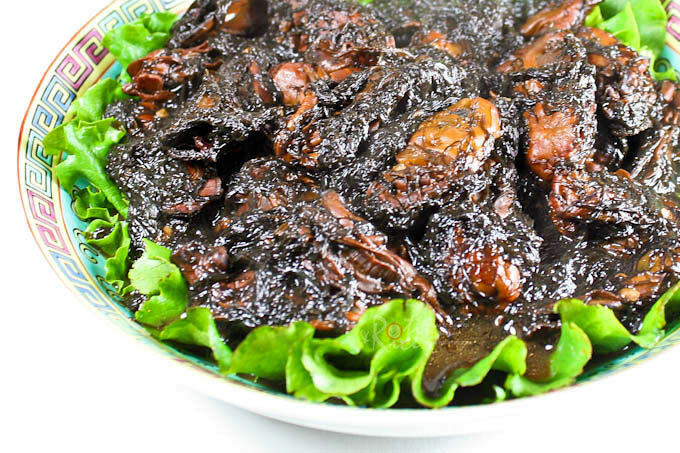 Thanks for sharing this traditional Chinese dish and congrats on the Top 9! Wow! That dish looks so festive and deliciou! So do all other dishes. You must have worked so hard during the New Year celebration. Your family is very lucky! Oh my, You’re such an amazing chef!! 😉 All of those dishes looks so so tasty. I wish I can celebrate Chinese new year at your home lol. Thank you for sharing this amazing post. wonderful and delicious!congrats on top 9,biren! Wow! This is one delicious Chinese New Year feast! We had ours at the restaurant! Love your yee sang! Hi…oooh I never thought of using taro for the yee sang and colouring it! I did do my own yee sang but use sweet potatoes and parsips and deepfrying them. Wonton skin is another I could add on as well! 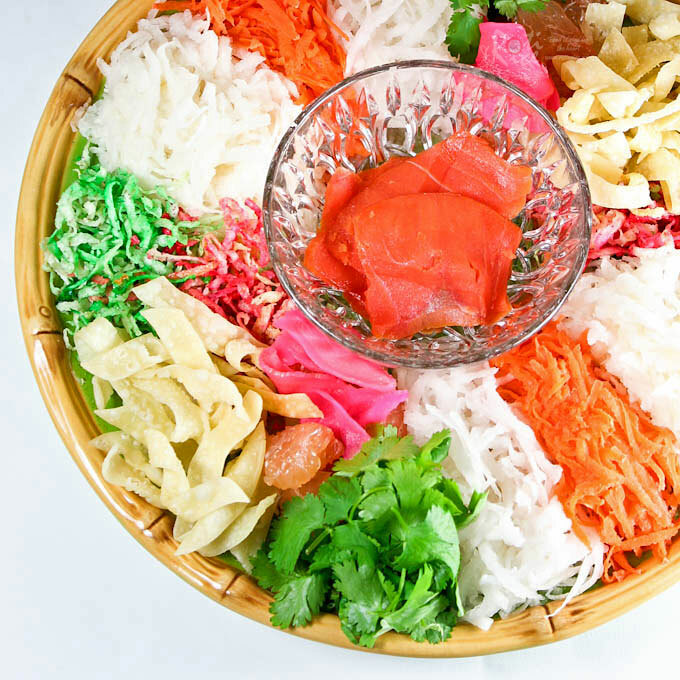 Great tips for my next round of yee sang! What are jicama & daikon? Congrats Biren on Top 9!! The pictures all look gorgeous and mouth watering. Your homemade lo sang looks so delicious. We are having our CNY party this Saturday and the lo sang is sent all the way from my mum (yes, a bit of a cheat) but the rest will be homemade…. 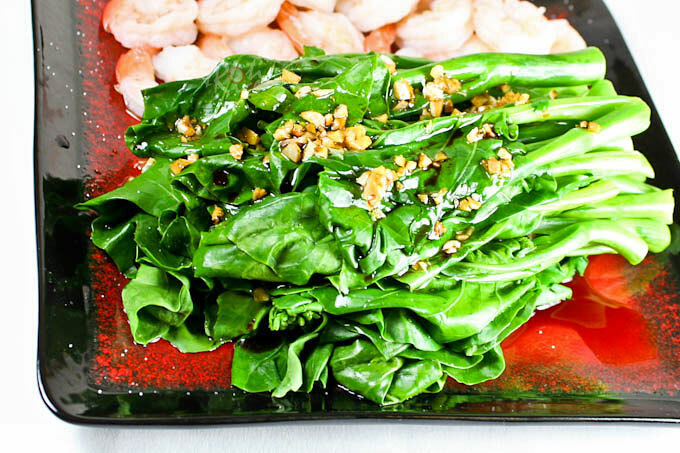 I especially like the traditional Ho See Fatt Choy but no one in my family would eat it.. Thanks DongXing! It’s ok to have a little help from ready made ones if you can get them. 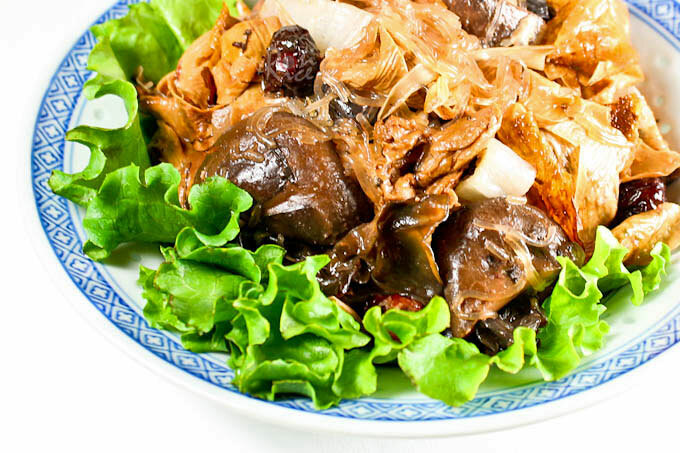 Perhaps you should just cook a small portion of the ho see fatt choy for yourself. We can always do with a portion of good fortune and prosperity for the year. 🙂 Have a fun CNY party! Wow! I love Yee Sang. I was introduced to this by my W.Malaysian Chinese friends. We have a slightly different version of this platter in E. Malaysia. WE called it the “leng pua” (cold plate), with the jelly fish as one of the star items on the platter. Biren, you have been working hard on CNY! I know the Yee Sang takes a lot of time to prepare. I’m sure it was worth every sweat and blood of your time. All the food looked amazingly gorgeous. YUMMY!! I am glad you got to try the W. Malaysian yee sang. Sometimes on top of the raw fish, some jellyfish is added as well. 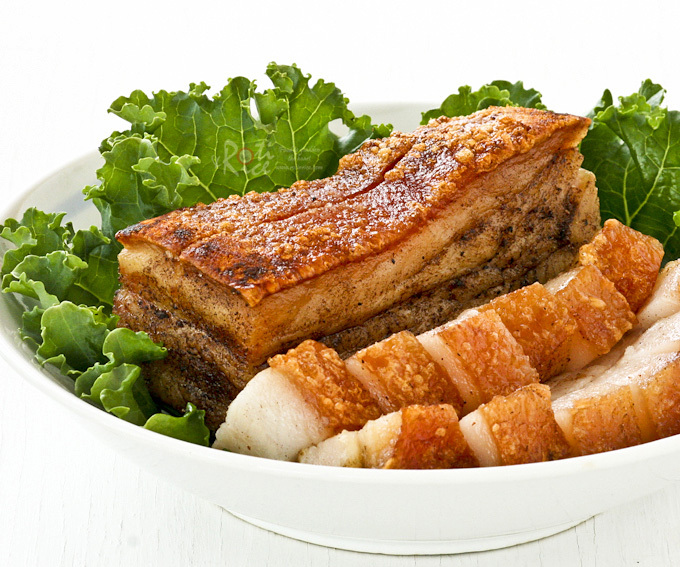 We do have a version of “leng pua” with 4 to 5 different dishes on a large platter served during a 10 course dinner. It is very delicious! Yee sang does take a little bit of work but it is definitely worth it. Thanks for the compliments! Wow, looks way better than the store bought ones! Hi Biren…wow….I would love to try this. What is Taro? Is it ubi keledek?